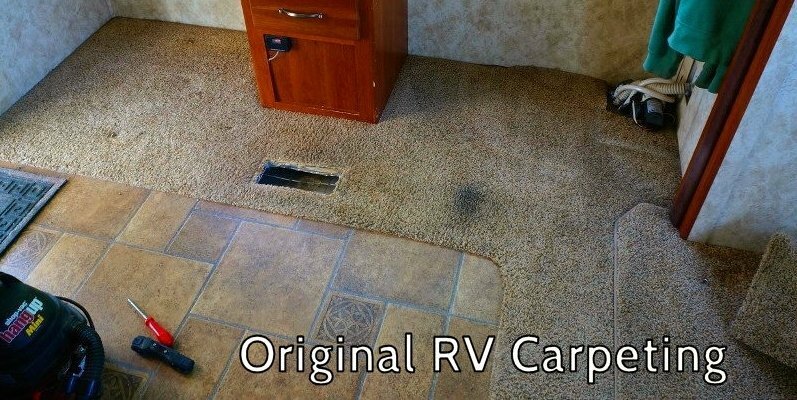 As many RVs do our Keystone Cougar trailer came with a fair amount of carpeting. It looked real nice when it was brand new, but that didn’t last too long. 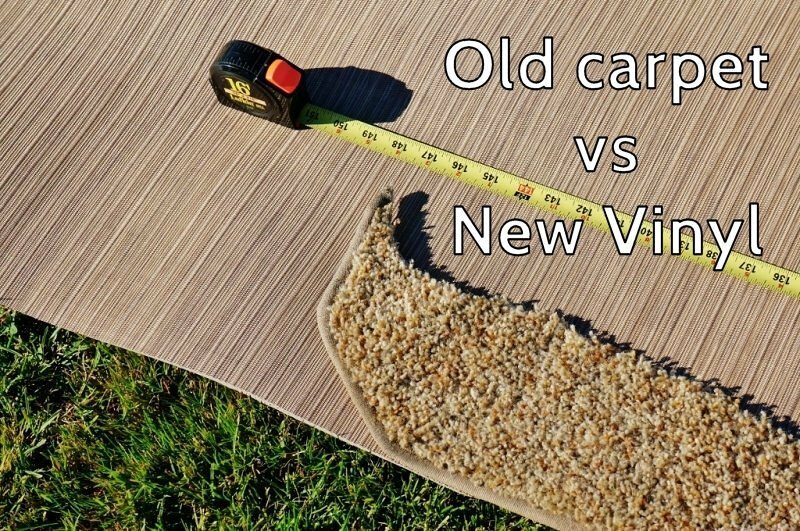 It is a pretty low-quality product and once it had some traffic and use it quickly flattened down. 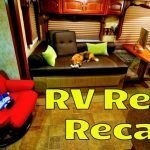 The RV carpeting is a magnet for dirt, dust and dog hair. I find myself constantly having to clean it, so much so I bought myself a portable carpet cleaner to carry with us full time. A while back I actually ripped a pile of it out of the main living area once I discovered there was linoleum underneath. 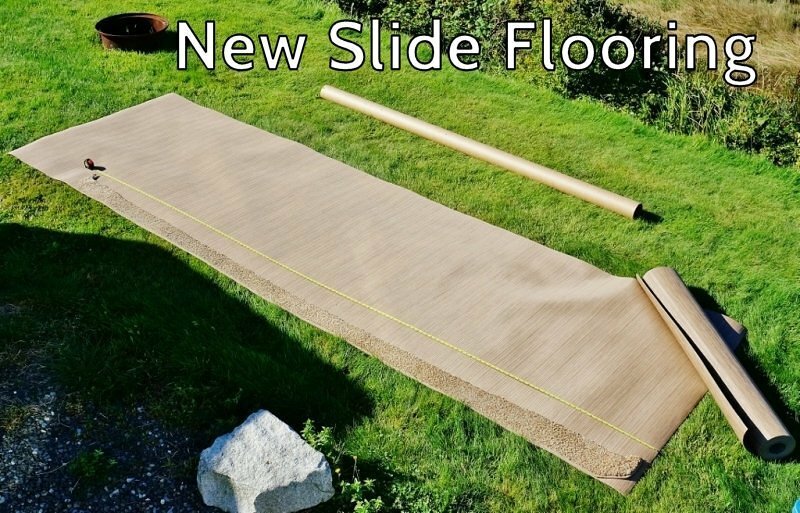 I liked it so much better without the carpet flooring my next target was to replace the slide out carpet. As fate would have it while I was mulling over the options in my mind I was contacted on Twitter by a company called Infinity. 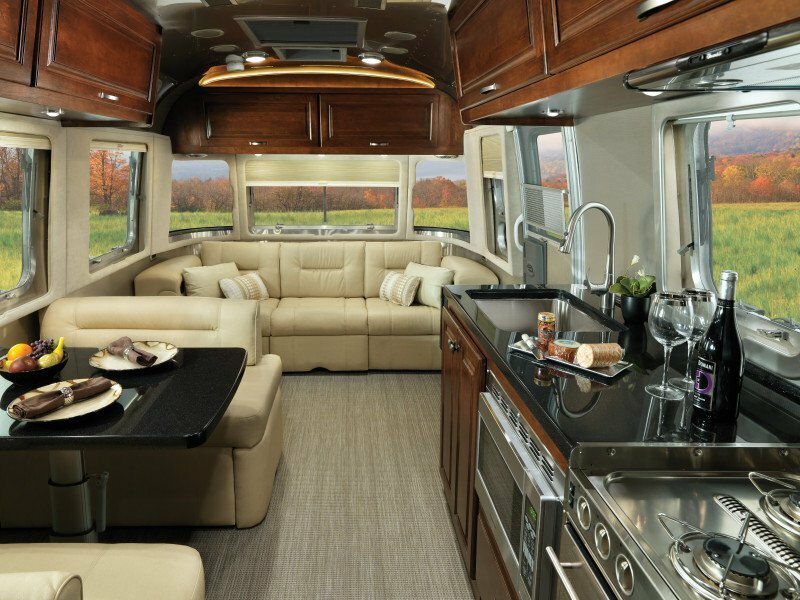 They offered to send me samples of an innovative new flooring product called “Luxury Woven Vinyl” or LWV for short. 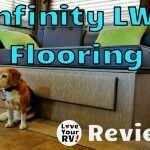 LWV flooring has been used on boats for a while now and seems perfectly suited for RVs. 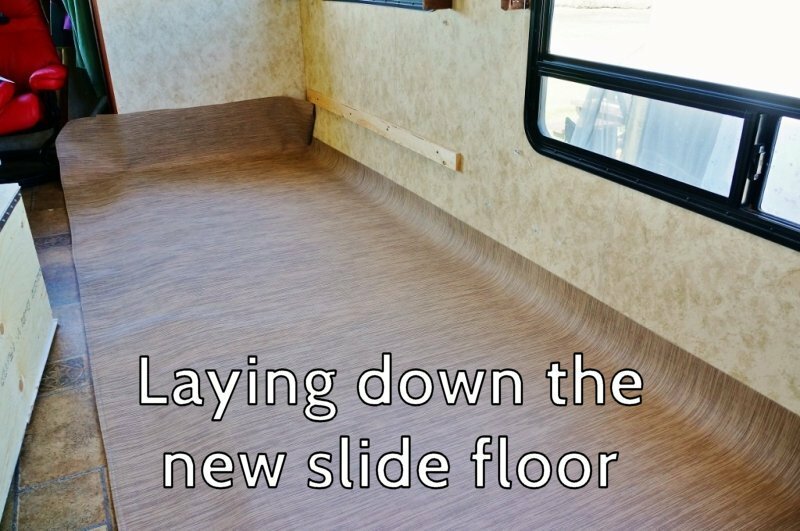 Being that it is not rigid type vinyl flooring, but more flexible like a carpet, it should be ideal for the slide-out area. 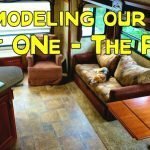 As any RVer knows the slide rooms present a challenge when it comes to flooring due to the (slide room to main room) transition joint. After pouring over the many sample swatches, we picked out the Bamboo #3 Compact Cushion variety to complement our rigs décor. 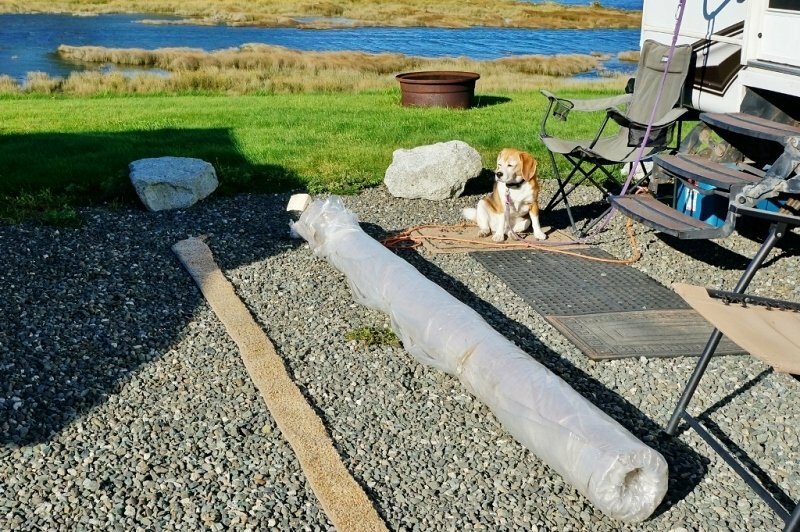 I also thought it would work really well as a finishing covering for a new custom daybed I’m building. Once I’m finished installing the new flooring and use it for a while I’ll be writing up a full review on the product. But, so far I’m most impressed! 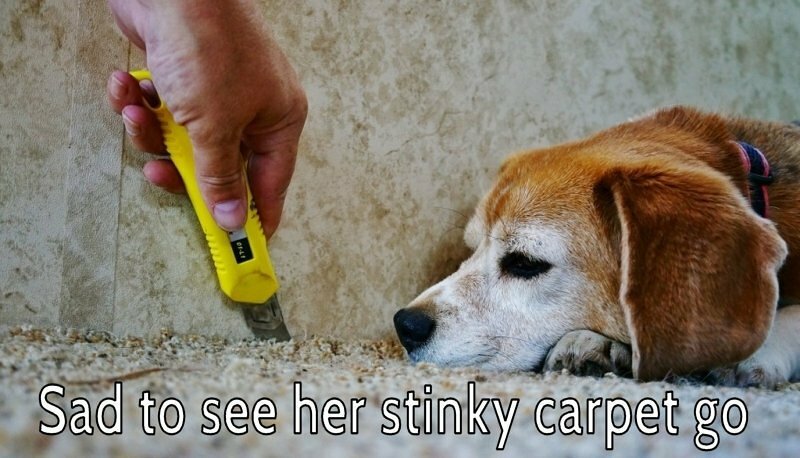 Armed with pliers, utility knife and scissors taking out the dusty, beagle hair filled OEM carpet was pretty straight forward. 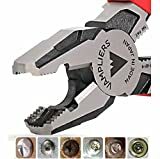 There were dozens of long skinny staples holding the carpet down, but my new VamPLIERS lineman pliers were perfect for the job and made short work of them. The biggest stumbling block was the edges. 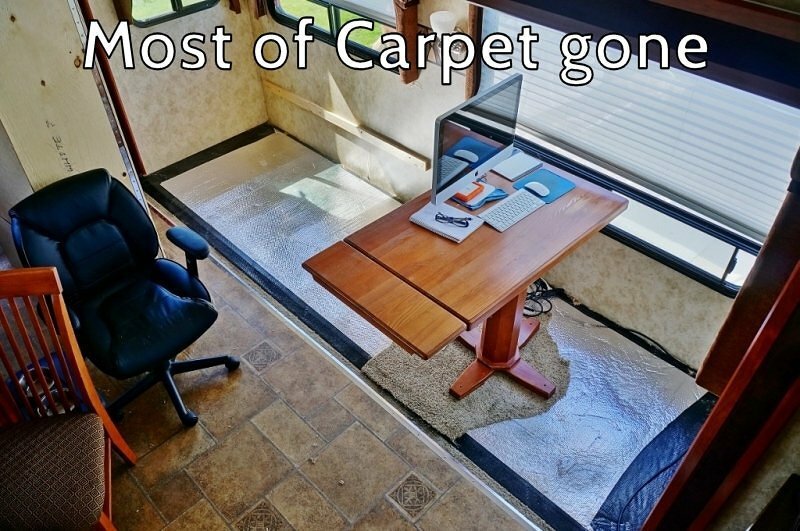 When Keystone built the trailer they laid down the entire flooring first then added the walls the carpet is tightly wedged in there. At first I was removing it slowly, agonizingly piece by piece, but soon learned the trick. If I took the sharp utility knife and ran it several times right along the wall pointed down into the corner I was able to get a clean cut. This worked out well except for where I ran into some flat round bolt heads in the way. Seems they added the bolts for the slides undercarriage hardware after the carpet was laid trapping the carpet under them. With a little patient cutting and snipping though I got most of the fibers out. Under the slide carpet, I found a layer of reflective bubble insulation. I left it in place to keep doing its job. 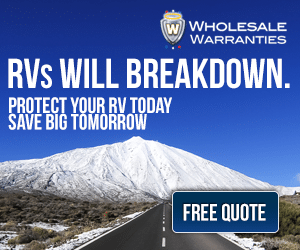 The final prep was a thorough vacuuming and washing. The floor was now ready for the new flooring to be laid. 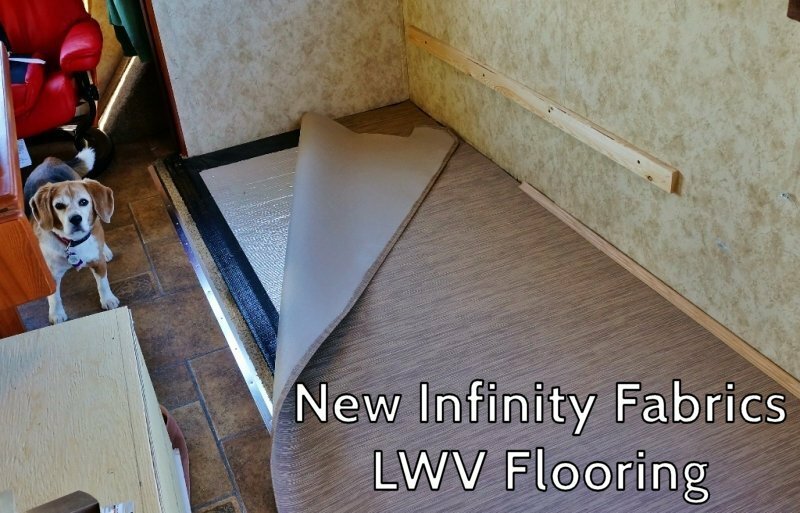 The Infinity flooring came on an 8.5-foot wide roll so the first thing was to cut it down to size for my slide area which is roughly 14 feet long 3.5 feet wide. I tested on a small sample first and found a sharp utility knife did a great job of slicing through the LWV and left a nice clean edge. Using a blue sharpie pen and a straight piece of lumber I drew a line on the foam backing and cut out my slide dimensions plus a little extra to play with. I needed a few inches for the front seam and corners. 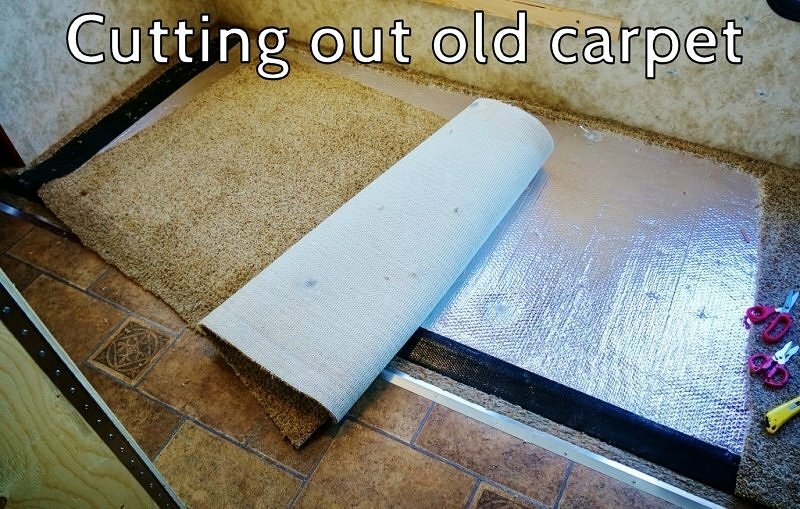 The original carpet had a nice seam sewn into the front. 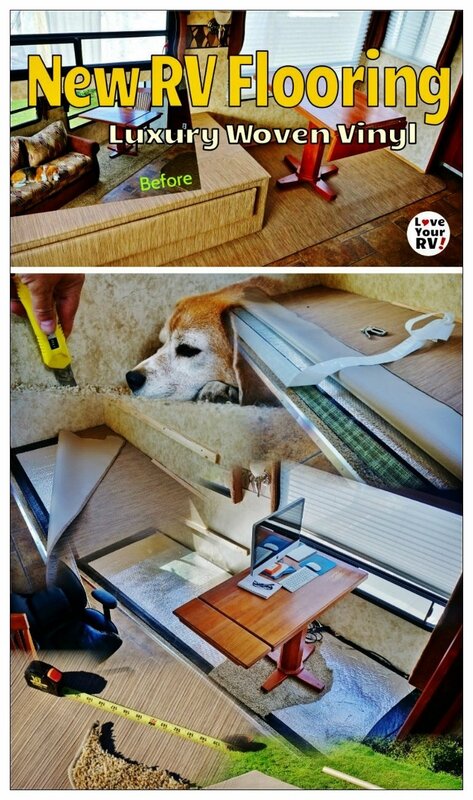 To replicate this, I decided to fold the vinyl flooring over and stitch it to itself. This wasn’t something I wanted to tackle so had a local upholstery shop do it for me. 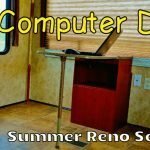 With their industrial sewing machines, it was a quick and inexpensive job. The flooring has enough weight to it to sit pretty flat on its own so I decided not to glue it all in place. 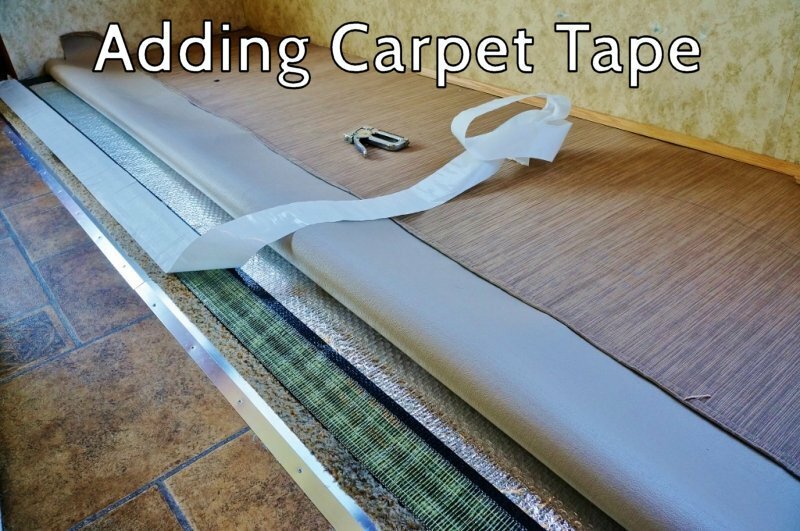 Instead, I ran my staple gun all around the perimeter and a long piece of double sided carpet tape along the front slide lip. 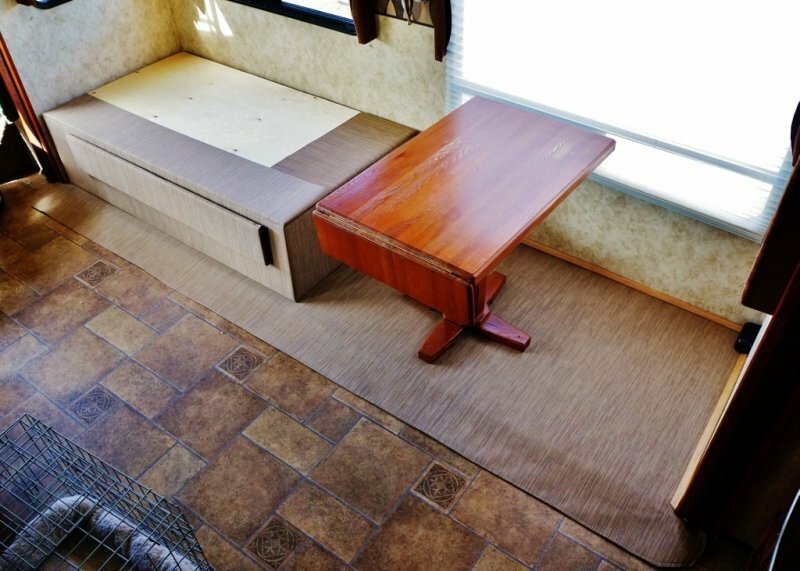 It will also have the daybed and a screwed down dining table holding it in place. 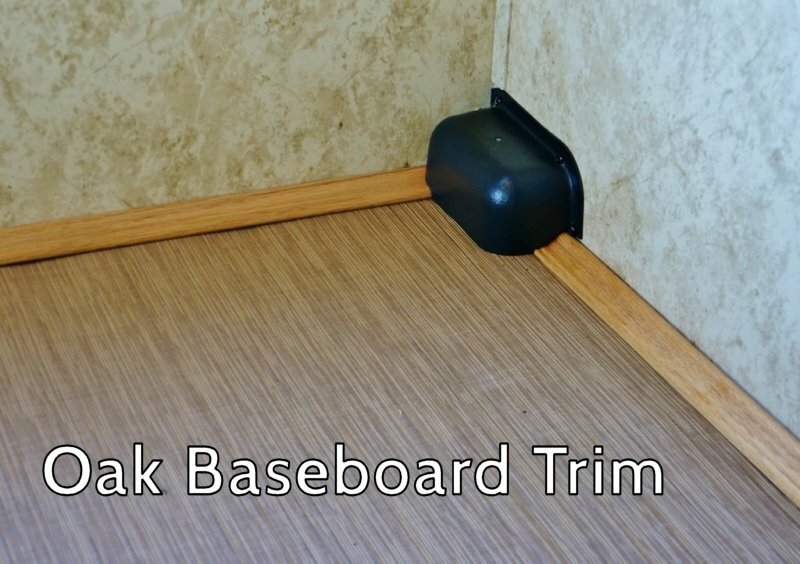 To complete things, I installed some beautiful oak baseboard trim to all the exposed wall corner seams. Rather than nail it in place I opted to use clear silicone rubber. 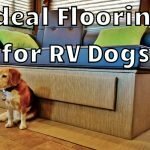 I did this last time I altered my main flooring and it worked very well. 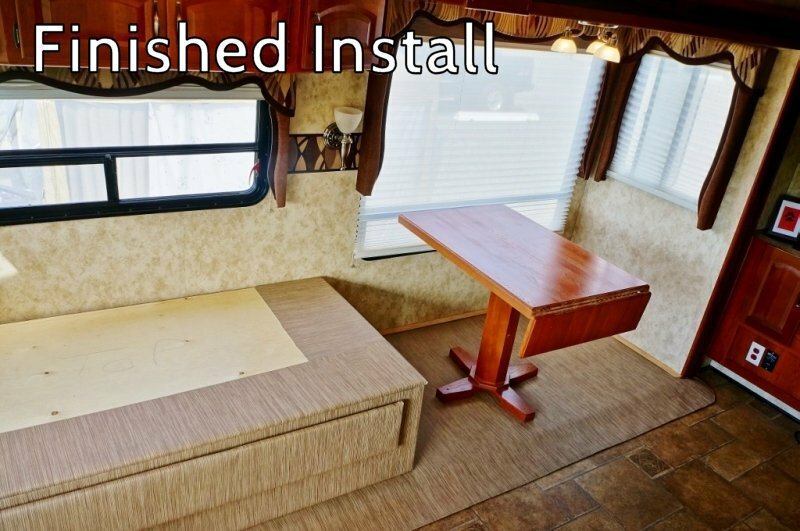 It holds the trim in place but at the same time it is very easy to remove if need be. It’s been just a few days but so far I’m loving the new Luxury Woven Vinyl flooring. 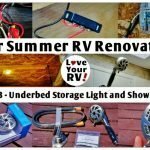 I found it super easy to work with and it looks fantastic in the RV. I can see why some of the new Airstream trailers are coming factory installed with it. 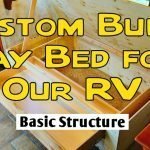 Next on the agenda is to complete my custom built daybed. I’m in the process of wrapping it in the same LWV flooring and finishing off a few interior bits and pieces. 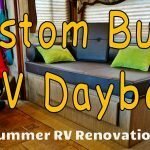 Then once we get the new mattress and cushions back from the upholstery place I’ll be putting together part 6 of the Summer RV renovations series with the final daybed reveal. I think it is gonna look pretty dang sweet!